Ellery Walker wants to avoid reality, or at least her mother’s version of it. Her family ‘stars’ on the hit reality TV show Life With the Walkers and Ellery despises every moment of it. Seeking escape she hides herself away at a community college, hoping to live peacefully as an anonymous student. When her plan backfires and her identity is revealed she has an entirely new set of problems to deal with. Sean Dixon is trouble, why else would the entire student body avoid him? His appearance doesn’t help matters. He’s tall, dark, silent and tattooed, there is no doubt he’s as dangerous as he seems. right? When a slip of paper throws these two together, both their ‘realities’ become entwined and in the end, there is no way for them to untangle. Will they even want to? In Murrison’s new adult romance novella, Ellery and Sean’s abundantly different realities come crashing into one another as fate intertwines them. To escape her reality, Ellery takes on her own big adventure – postgraduate education. Trying to hide her identity, Ellery wishes to live a normal life like everyone else…but fate has no such plans for her, for she meets the “bad boy” Sean Dixon and becomes involved in so much more than she anticipated. A coming of age novel that highlights on a number of subjects we face in our world today, Murrison’s story is a loving tale about forgiveness, family bonds, overcoming trials, and unconditional love. Character oriented readers will be happy to know that Murrison’s novel is STRONGLY focused on the characters and their progression throughout the story. Additionally, the characters are likable and memorable. Ellery is absolutely adorable, one that us clumsy and shy individuals can easily relate to. Sean, the second main protagonist, is rather charming and driven; his ambitions and strive to battle through his trials are rarely found in society. The characters all had very unique personal stories and backgrounds; this made it really hard to put the book down, since I wanted to uncover their pasts so fast! After reading the synopsis, it’s hard to NOT want to give Murrison’s novel a try. Two main protagonists living in VERY different “realities” coming together and seeing each others hidden secrets and pasts unfold…what’s not to love about that? The story also just kept on giving, moving from one momentous event to the next. What I enjoyed is Murrison didn’t paint Ellery’s famous family as villains simply because they’re famous, giving them a rather interesting story; however, she also doesn’t neglect to highlight on the luxuries they have due to their fame. Gender identity and exploration, interracial relationships, domestic abuse, assault, cyber-bullying, invasion of privacy…these are just a handful of the topics explored in this novel. There’s a need for literature to continue touching upon these topics, both to rid (or at least reduce) the world of discrimination and for future generations to look back and learn from our mistakes. Exploring so many topics helps more readers to connect with the novel, for most will have experienced at least one of the many discussed issues. Though the plot is intriguing, it fell through about two chapters into the novella. The writing’s so simplistic that it felt parts of the story were missing. A number of jumps in the story occurred when their could’ve been more content, making Murrison’s story feel incomplete. Additionally, the MAJOR story reveals (and I mean some pretty dark stuff) about characters and other events fell short as well. Murrison would provide this epic revelation, then simply dismiss it or have it QUICKLY resolved…I was left flabbergasted. There was A LOT happening in a less than 200 page novel, which may explain the rushed nature of the writing. If Murrison added an extra 150 pages or so, the story may have been more “fleshed out”. In my personal opinion, character development should be gradual, allowing the readers to slowly see the changes of the characters throughout the novel. However, it was incredibly fast and felt like an overload of information, especially when there are a number of characters with “hidden and mysterious” pasts to unfold. Furthermore, the characters actually felt as though they didn’t fully reflect themselves anymore; there were statements and action made by characters that completely went against how they appeared at the beginning. The balance between descriptive narrative and dialogue was very unbalanced, making it more difficult to connect with the story. There are a number of sections where the narration will state: “Ellery told [BLANK] how she felt”. For me, I’d rather read the actual dialogue that happens between the two to feel the tension and emotion in that portion of the novel. There’s instalove…and then there’s INSTALOVE TO THE MAX! It felt incredibly unrealistic. Ellery and Sean are an adorable couple, yet their relationship moved way too quickly. Sean’s character has a rather dark past, which made Ellery’s desire to move forward with him so quickly a SHOCK. Not only this, but their willingness to divulge into their secrets and personal trials within the first few chapters of the story felt incredibly rushed…making it really hard to take the relationship seriously. Though my grammar and spelling mistakes are FAR from perfect in my reviews and throughout other parts of my life (probably in this review now…), the issue still stands that Murrison’s novella requires a wealth of further editing. Every single page has a minimum of one spelling or grammatical error, if not more. The grammatical errors actually made it hard to read. There were sentences I had to re-read multiple times before I could grasp what was happening…the use of a comma is a beautiful thing! I also received an ARC, so the changes may have changed before it was published. The point of view narration also was rather odd. I didn’t notice until halfway through, but Ellery’s POV is first person, whereas Sean’s is in third person…I personally wasn’t a fan of this. 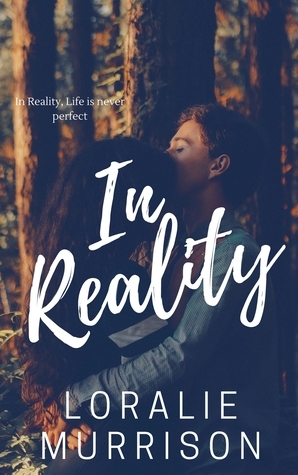 A truly adorable novella, Murrison’s In Reality is an easy read that highlights on the struggles of young love in addition to focusing on a number of “real life issues” people face today. Even with the grammatical errors and the “incomplete” feeling, Murrison’s Reality series has great potential and a number of compelling elements. If you’re looking for a fast read with quirky characters and a memorable love story, Murrison’s novella may be for you.